Tagged as Travis Designs, Unicorn Tutu Set. 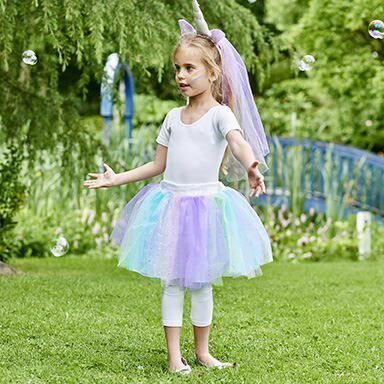 This magical tutu skirt consists of sparking layers of pastel rainbow tulle in seven different colours overlaying a soft, white satin lining. The matching headband has a padded silver horn, purple felt ears, pretty flower trims and a pastel rainbow tulle veil. Packaged on a header card.